This is ‘Radiant House’ on Mortimer Street, just round the corner from my old office. I walked past it most mornings, always looking up, depending on the route I took from the station. I’m no architect nor architectural historian, but I know enough to see elements of classical styling with even touches of art deco (the wrought iron inserts on the top floor). Radiant indeed. 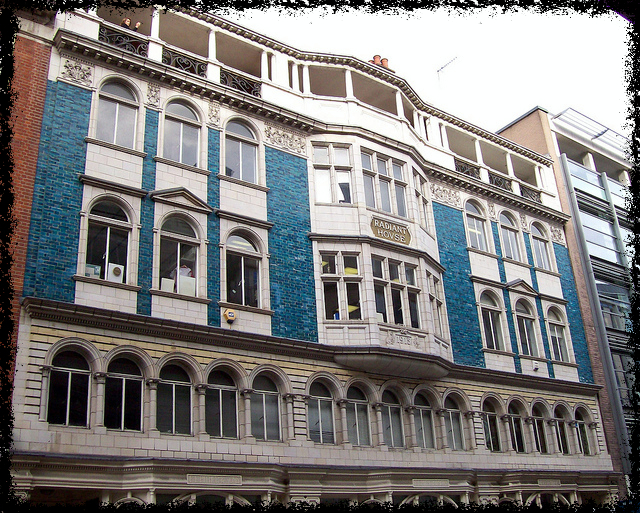 Would we see aquamarine tiles on a building today? Yet look. Just below the name of the building is a smaller inscription. 1915. The year of the Dardanelles. Gallipoli. The Second Battle of Ypres. It’s difficult now to imagine the mood of disquiet & national depression as losses mounted up. Here is a beacon of hope, the building says.